Warranty coverage for products produced by another manufacturer is limited to the warranty offered by that manufacturer. New Crate Engines come with a 6 months parts replamcent warranty starting from the day the engine is delivered/picked up by the customer. Performance modifications or damage due to operator error (for example: overheating, over revving, missing a shift, improper break-in, improper installation, lack of oil and regular maintenance etc..) will void the warranty. Diesel Kings Industries, LLC, DBA “Big Bear Engine Company” and/or OEM reserves the right to inspect damage to new or resold components for failure analysis. See the full provisions list in section “Warranty Policy and Claim Procedure Containing Arbitration Provision” below. Every engine is completely disassembled. Blocks, heads, rods, crankshafts and camshafts are thoroughly cleaned to remove all contaminants which can lead to early component and engine failure. Crankshafts are precision machined to exact tolerances, polished & magnafluxed, then inspected by our quality control department. Heads are resurfaced to assure a proper sealing surface with the block and a finish compatible with today's new gasket materials. Valve height is mic-d and every head is vacuum tested to assure correct valve seating. Blocks are magnetic particle inspected for cracks or imperfections. Cylinders are bored and honed and inspected to precise tolerances. Torque plate honing is performed on specific engines to eliminate cylinder head distortion after the head is bolted and torqued to the block. This process eliminates a major cause of engine blow-by. Block surfaces are machined and then inspected to ensure proper finish. Camshafts are inspected and precisely machined to provide correct lift. Connecting rods are cleaned, then machined to O.E.M. specifications and honed to the standard diameter of original equipment for even distribution of stress on the bearings. New bushings are installed and machined in all bushed rods. Every rod is carefully inspected for bend and twist. Big Bear Engine Company’s engines receive a standard set of new parts such as pistons and rings, bearings, gaskets and seals, liners. New parts assure consistent performance and reliability throughout the life of your engine. To remanufacture is to make as close to new as possible. Wearable parts are automatically replaced. All core material is closely inspected and checked against original equipment specifications for correct dimensional tolerances. Replacement parts are new or requalified. If new, parts are made in the same production processes as original equipment. Testing is performed to manufacturer specifications and original production standard. Big Bear Engine Company’s Remanufactured Long Block Engines include the following components: Cylinder Block, Complete Cylinder Head, Crankshaft, Pistons, Liners, Rings, Connecting Rods, Camshaft, Followers/Lifters, Intermediate cover and timed Front Gear Group. Repair and Return Engines will follow the same process as remanufactured engines, however Big Bear Engine Company will work with the engine and components that have been provided by the customer. From time to time there can be instances where parts or components are not able to be remanufactured. In instances where parts or components cannot be remanufactured the cost of replacement for such parts or components will become the responsibility of the customer if they elect to replace them. Failure to replace recommended parts or components will void warranty. This limited warranty covers the remanufactured long block engine as it pertains to workmanship, parts and components used for, and in the long block engine. The warranty covers defects in materials or workmanship on the part of the remanufacturer. Warranty coverage begins at the time of shipment and does not renew if replaced during the warranty period. The warranty coverage may not exceed the original purchase price paid for the remanufactured engine. • Parts and products produced through another manufacturer or remanufacturer. Coverage for any such parts and products shall be limited to the warranty offered by that manufacturer. • Damage caused by installation or related vehicle problems is not covered, as well as installation in a vehicle for which it was not designed or purchased for. • Misuse, maintenance neglect, abuse, vandalism, abnormal operation, environmental conditions, accidents or modifications of the engine outside of original specifications. • Overheating engine voids any warranty for labor or replacement. • Damage caused by lack of lubricants or fluids that lead to engine failure will void the warranty. • Failure caused by components or parts not furnished by the remanufacturer. • Damage to the engine caused by detonation or pre-ignition. • Damage caused to engine thrust bearing from defective torque converters, clutch assemblies, engine or transmission mounts. • Any repairs not authorized or approved by the remanufacturer will void the warranty. Your warranty begins on the original date of shipment and expires in 12 months subject to the limitations set forth below. This warranty is extended only to the original purchaser and cannot be transferred to anyone at any time without prior written permission of Diesel Kings Industries, LLC (DBA Big Bear Engine Company). For remanufactured parts and components, and in the event of failure, Diesel Kings Industries, LLC (DBA Big Bear Engine Company) will, at its sole discretion, pay for parts replacement at Diesel Kings Industries, LLC (DBA Big Bear Engine Company)’s cost, or replace the parts or components to the condition prior to the failure if the failure was attributed to workmanship or parts defect. 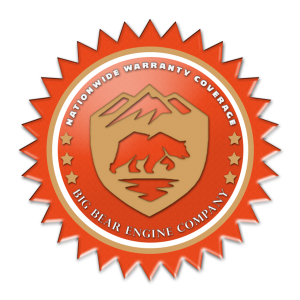 For remanufactured engines, Diesel Kings Industries, LLC (DBA Big Bear Engine Company) provides a 12 month unlimited miles warranty. The first 6 months includes a parts and labor, and the second 6 months includes parts replacement specific to the remanufactured engine and its components. Labor is paid at a pro-rated labor rate of thirty dollars U.S. per hour. Immediately after discovery of any problem, and prior to the expiration of the warranty period, you must follow the procedures listed below. Failure to do so will void your warranty. • All failed parts and components should be returned and accompanied by (1) copies of any work orders and receipts for parts used for the repair; and (2) a completed warranty claim form provided by Diesel Kings Industries, LLC (DBA Big Bear Engine Company). • The failed parts and components, along with the warranty material identified above, must be sent to Diesel Kings Industries, LLC (DBA Big Bear Engine Company) freight prepaid. • If a claim is settled, the parts and components involved shall become property of Diesel Kings Industries, LLC (DBA Big Bear Engine Company). If a claim is denied, the parts will be returned at your expense. TO THE FULLEST EXTENT OF THE LAW, THIS LIMITED WARRANTY IS MADE IN LIEU OF ALL OTHER WARRANTIES, EXPRESS OR IMPLIED, INCLUDING WITHOUT LIMITATION WARRANTIES OF MERCHANTABILITY OR FITNESS FOR A PARTICULAR PURPOSE. BUYER EXPRESSLY WAIVES ANY AND ALL RIGHTS TO RECOVERY INCIDENTAL, CONSEQUENTIAL OR SPECIAL DAMAGES. SHOULD ANY DISCLAIMER OR REMEDY LIMIT IN THIS WARRANTY BE DECLARED OR BECOME INVALID OR UNENFORCEABLE FOR ANY REASONS, THE REMAINING TERMS AND CONDITIONS SHALL REMAIN IN FULL FORCE AND EFFECT. UNDER NO CIRCUMSTANCES SHALL DIESEL KINGS INDUSTRIES, LLC (DBA BIG BEAR ENGINE COMPANY)’S LIABILITY UNDER THIS WARRANTY OR OTHERWISE EXCEED THE PRICE PAID OR INVOICED FOR THE REMANUFACTURED ENGINE. ANY ACTION AGAINST DIESEL KINGS INDUSTRIES, LLC (DBA BIG BEAR ENGINE COMPANY) MUST BE COMMENCED WITHIN 12 MONTHS FOLLOWING THE TIME THE BREACH IS DISCOVERED OR SHOULD HAVE BEEN DISCOVERED. THIS AGREEMENT IS GOVERNED BY THE LAWS OF THE STATE OF COLORADO, THE PRINCIPAL PLACE OF BUSINESS OF DIESEL KINGS INDUSTRIES, LLC (DBA BIG BEAR ENGINE COMPANY), WITHOUT REGARD TO CHOICE OF LAW PRINCIPLES. ANY CONTROVERSY OR CLAIM ARISING OUT OF OR RELATING TO THIS LIMITED WARRANTY SHALL BE SETTLED BY ARBITRATION ADMINISTERED BY THE AMERICAN ARBITRATION ASSOCIATION (“AAA”) IN ACCORDANCE WITH ITS COMMERCIAL ARBITRATION RULES. THE ARBITRATION HEARING SHALL TAKE PLACE IN DENVER, COLORADO BEFORE A SINGLE ARBITRATOR, SELECTED BY THE AAA, EXPERIENCED WITH MANUFACTURER WARRANTY DISPUTES.